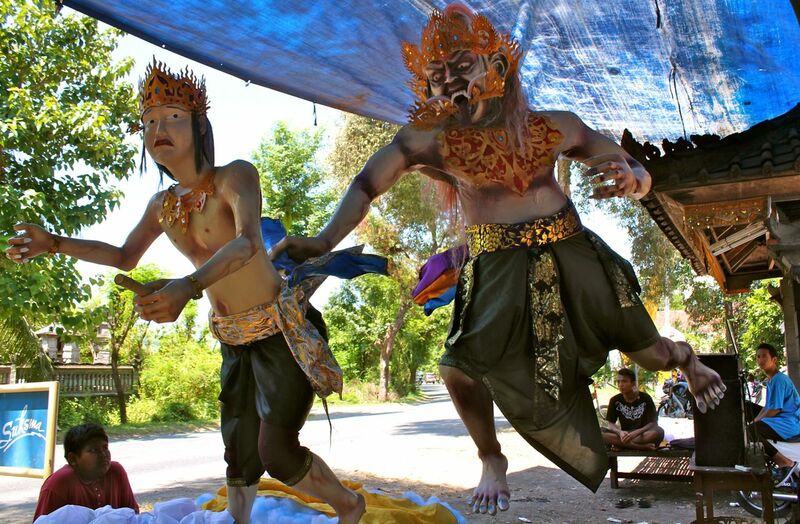 A demon chases a young prince in this “ogoh-ogoh,” made out of bamboo and papier-mache by children (pictured) of Pemuteran, Bali. Today, across the island of Bali, something is happening — which is to say, nothing is happening, and that is why it’s so special. Today is Nyepi, or the day of silence, the lunar New Year celebrated in Bali’s unique Hindu tradition. For 24 hours, across the island, there will be no talking, no cooking, no eating or watching TV. Instead, there will be only quiet introspection as the Balinese practice the four abstentions: from lighting fires or lights, from work, from travel outside the home and from pleasure. The streets will be empty; the many seaports and only airport will be closed. Nyepi is universally respected across the island. In fact, in Indonesia, a nation of more than 200 million Muslims, Nyepi is a national holiday. Though it is not widely practiced anywhere else, recognition by the national government enables Bali’s 4.2 million residents one day of true silence. This ogoh-ogoh was set aflame on the eve of Nyepi, March 30, near Pemuteran, Bali. Several days of preparation lead up to Nyepi. Three to four days prior (on March 29th this year), Balinese practice Melasti, holding processions at major beaches and rivers to cleanse sacred items from the temples and recharge their supernatural power. Then, on the eve of Nyepi, a ruckus erupts. In an effort to stir up evil spirits, people bang pots, pans, empty water bottles, or anything they can find. 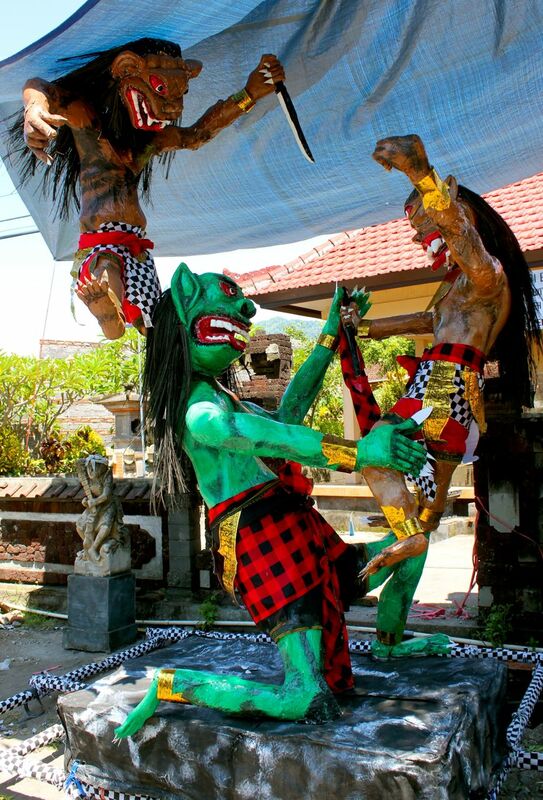 The commotion continues for the parade of ogoh-ogohs: giant papier-mâché representations of evil demons that are made by the children of every village in Bali. The ogoh-ogohs call evil spirits from every home as they are marched though the town. At the end of the parade, the papier-mâché figures are set aflame to banish the evil spirits back to their natural homes. Once the demons have been flushed out, around midnight, the silence begins. The day of introspection provides both people and nature a chance to recuperate from the impacts of modern life. As an American, I am astounded by the preservation of Nyepi. In the U.S., as consumerism threatens to swallow up any “sacred” day, be it Thanksgiving or Christmas or even Martin Luther King Day, the “meaning” of our holidays has become trite cable-news fodder. Now, major retailers are open on Thanksgiving, robbing their employees of the chance for a full day of thanks, and creating greater pressure to spend the holiday shopping. In a sense, America’s secularism has stripped holidays of their cultural uniqueness and has unified them under the cult of consumerism. Conversely, in Indonesia, a complex need for multiculturalism has carved out space for individual religions. On the raucous party island of Bali, Nyepi is a fascinating example of one culture’s sanctity being preserved against the odds. We left Bali just before Nyepi. In our endless search for peace and quiet outside of bustling Jakarta, though, we might have done well to stay. A Melasti ceremony takes place on the beach near tourist resorts in Pemuteran, Bali. This entry was posted in Culture, Indonesia, Religion and tagged Bali, day of silence, fasting, indonesia, island of Bali, new year, ogoh-ogoh, Pemuteran. Bookmark the permalink. Great blog! It’s mind-boggling to me that this can actually happen. Thanks for sharing.